• ArcSpace brings us eyefuls of Isozaki & Kapoor's planned ARK NOVA, a traveling concert hall in Japan (it's - um - interesting); and H&deM's stadium in Bordeaux. • The NEA coordinates ArtPlace, a grand new initiative to help fund ''groundbreaking work in creative placemaking" (and time to submit for next grant cycle). • Research shows brains of city dwellers function differently from their country cousins, which "could help city planners determine which design features would provide the most solace" (and add fodder to grant submissions for ArtPlace?). • Nobel takes a look what new architectural openings are on the horizon, but "the biggest metaphorical event in the year ahead may be the implosion" of Foster's never-completed Las Vegas tower, "sure to spark talk about the state of architecture today." • Glancey's review of the week includes his take on the high-voltage shortlist of RIBA's pylon competition (and lots more). • It's a starchitect kind of day: Denver hopes losing two starchitects in five years won't "hinder future efforts to attract the best in the business" + Calatrava makes first comments re: his Denver International Airport divorce. • Heathcote has a hearty conversation with Viñoly re: past and current projects (he thinks Battersea and the Domino refinery "could be disposed of...what the buildings do to a forward-looking plan is enormously detrimental"). • Moore wants to like Viñoly's Firstsite in Colchester, but it leaves him puzzled: "There is a pattern to his projects. They have whoosh and sparkle" that appeals to "the glitter-loving magpie inside us...But the closer you look...the less sense they tend to make." • An eyeful of Piano's controversial expansion at Corbu's Ronchamp Chapel: if a different architect had been hired for the job, "I would probably be worried, so I can understand." • She'll be the latest star in Miami Beach's crown of starchitect-designed parking garages. • Corbu to be grandly feted during Chandigarh College of Architecture's 50th anniversary, with Pritzker winner Souto de Moura kicking things off October 7. • Australia to help bring the memorial Bali Peace Park design closer to reality. • We don't usually cover products, but who knew Heathcote heads a hardware company - celebrating its 10th anniversary of working with some of the best and the brightest! • Woodman cheers the "inspired appointment" of de Rijke at the Royal College of Art as "a welcome shift towards closer links between teaching and practice"; his RCA "looks like it is going to sport notably muddier boots." 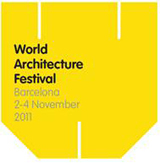 • Holcim Awards 2011 European winners announced (great presentation!) + GRAFT Architects win European Prize for Architecture 2011. • Call for entries: [re]stitch TAMPA International Ideas Competition + "Design of the ground public space - University Parking: Technical Project" in Bucharest.